Goodness ! Has it been busy or what lately? In the last couple of days I haven’t had much of a chance to share with you some of the thoughts that have been going on in my mind lately. The last one being the concept of Tacit Knowledge and how much it has been talked about all over the place. So that would come shortly, not to worry. What I wanted to point out to you today is the second part of a recent podcast that I have done, once again, with the IBM Shortcuts team, around the subject of "How to Use Wikis at Work (Part Two)". In that particular podcast, and just about under five minutes, you would get to hear about some different hints and tips, and techniques, you could make use of in order to help different teams, communities, or whatever other groups, to make the most of their own wiki experience. Yes, I know that this is a subject that has probably come up already within your own business in multiple times. The fact that once you get a wiki set up and running you actually find out that it takes a little bit of effort and facilitation to make it work, specially if those knowledge workers are not very used to sharing knowledge and collaborating in an open environment where everyone is in control. 1. A Critical Mass of Early Adopters who can pave out the road for those non tech savvy knowledge workers so that they can focus on sharing what the know as opposed to struggle with the tool itself. 2. Fully supported infrastructure in place so that collaboration takes place with a sense of belonging, or ownership, from the perspective that knowledge workers’ contributions remain there for as long as possible and therefore they can refer to them back and forth and continue to build further up on it. That sense of ownership. 3. Online tutorials or screencasts on how to perform essential tasks: like adding a page, managing an access control list, subscribing to RSS feeds, etc. etc. so that they would have a chance to find solutions to easy tasks quickly and move on forward just focusing on what really matters: sharing their knowledge and collaborating with others. So there you go. If you would want to listen to this second part of the IBM Shortcuts podcast on How to Use Wikis at Work head over there and enjoy it. I am sure that you would have plenty more tips you have been advocating for in order to help people adopt wikis within their own tools suite for collaboration and I would surely love to hear some more about them. So feel free to drop a comment over here or at the actual podcast site. Please check out http://www.itensil.com. I remember from the 90s how advanced IBM was in knowledge management practices. I’m also doing an article this month for Computerworld (US). If you have a client who is rolling out or currently employing a leading edge enterprise 2.0 solution, please let me know! Thanks Luis! p.s. where is Gran Caria? Hello Susan ! Thanks ever so much for dropping by and for the kind feedback comments ! Welcome to elsua! I am really glad we have been able to connect through this particular weblog post because I have been checking out your own weblog, which I discovered myself through your reply, and I am really excited to read about the stuff you are covering in the area of Enterprise 2.0. In fact, we share a good chunk of the blogroll, although I am in the process of updating mine, but I can tell you that we seem to be doing similar reading in this particular space ! Terrific stuff ! I just couldn’t help it, but have subscribed to your weblog already and will be catching up with you and linking in the near future with some of the different weblog posts you have already shared. I went ahead and checked out Itensil and watched through the demo and read a couple of the weblog posts and the work you guys are doing sounds really fascinating ! I am not sure what you would think but I am not certain there are many companies attempting to do what you are currently attempting to do at the moment. It sounds like you are taking wiki collaboration into the next level, which, to me, is going to be a key success factor: integrating wikis into the main process and business flows. Fascinating ! Yes, indeed, IBM was very advanced in KM practices during the 90s, time during which I joined IBM, but I must admit that things are much more exciting at the moment trying to look for a more balanced approach to KM strategies combining both of the traditional KM stuff (That explicit knowledge) with the new and emerging social software technologies (Yes, that tacit knowledge) in order to provide a much more sensible approach towards what KM should all be about. As I said, quite exciting. REgarding your article this month at Computerworld I shall have a look with some of my colleagues and see what has been happening over there and if there is any worth while noting I shall let you know offline. Thanks again for the feedback and welcome, once again, to elsua! Whooops, I forgot about that one, Susan. Gran Canaria is one of the 7 islands from the Spanish Canary Islands. 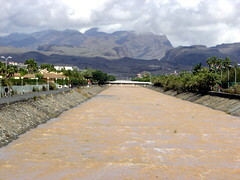 You can find more details about it, of course, at the Wikipedia entry for Gran Canaria. Hope that helps. Thanks a bunch, frogpond, by the way, for the trackback and the link love. Appreciated, both the link to the first episode and the second one, along with the kind comments. Good stuff! Those are great tips for building a wiki community. With useful back-channel tools such as Skype, IM or even e-mail, a great way to get into wikis is via a mentor. Nothing like having someone you trust to answer your questions, guide you through confusions and teach you the critical shortcuts. One of the fundamental dilemmas about wiki participation is the difficult choice to refractor existing text or append. Things can get ugly quickly (witness some of the wikipedia fracas) when others mess with your text. Always useful to post guidelines or move contested pieces to a parallel discussion (or talk) page. In some wiki environments there is no guarantee that your words will stay – rather the promise or hope is someone will come along and work them over thus improve them! What I really like about wikis is they are concept centric so it is easy to add, remodel, or sub-divide – you often find individuals taking ownership for topics and doing the gardening. Hi Denham ! Thanks a lot for the kind feedback comments and for adding further up into the conversation ! Excellent stuff! I certainly agree with you that wikis would be very much in need of having additional tools that would help knowledge workers collaborate in a more real-time fashion, synchronous, as opposed to just asynchronous, because that would certainly help enhance the capabilities of the collaborative scenario at hand. For instance, wouldn’t it be great if you would have a couple of folks accessing a wiki page and then find out that they are both active and online in Skype, as an example, and that with a single click of a button they could start chatting / talking away ? That would be just terrific ! You bring together as well an interesting point with regards to refractoring existing text or append and although I agree with you 100%, the proof is out there, in plenty of examples, I must say that I have always felt that this is also a case of how much you trust the knowledge workers you collaborate with on a regular basis. I bet that the more you get to interact with them the much easier it would be to accept that your content would be updated and improved by others. I must say that many years ago, when I was first exposed to wikis I actually had the same issues with refractoring, but then again in a particular project it suddenly clicked with me because we were all a bunch of folks who trusted each other for doing our jobs and help improve others’ and ever since then, where we got to produce some really impressive results, I have always tried to move forward with this and trust the folks I collaborate with. If we would need to have a separate space to chat let be it, but also if the conversations are going to take place in the wiki, let’s get just things going, trust each other some more and get the job done. Yes, I know it sounds a lot easier said than done, but it is not that difficult to work on some activities, prior to collaborating in a wiki, in order to help people break those barriers and start trusting each other much more. What do you think ?